For the colonists of the new world, the years of the American Revolution were a time of upheaval and rebellion. History boils it down to a few key events and has embodied it with a handful of legendary personalities. But the reality of the time was that everyday people witnessed thousands of little moments blaze into an epic conflict-for more than twenty years. Now, for the first time, experience the sparks of revolution the way the colonists did--in their very own town newspapers and broadsheets. Reporting the Revolutionary War is a stunning collection of primary sources, sprinkled with modern analysis from 37 historians. Featuring Patriot and Loyalist eyewitness accounts from newspapers printed on both sides of the Atlantic, readers will experience the revolution as it happened with the same immediacy and uncertainty of the colonists. The American newspapers of the eighteenth century fanned the flames of rebellion, igniting the ideas of patriotism and liberty among average citizens who had never before been so strongly united. Within the papers, you'll also read the private correspondence and battlefield letters of the rebels and patriots who grabbed the attention of each and every colonist and pushed them to fight for freedom and change. 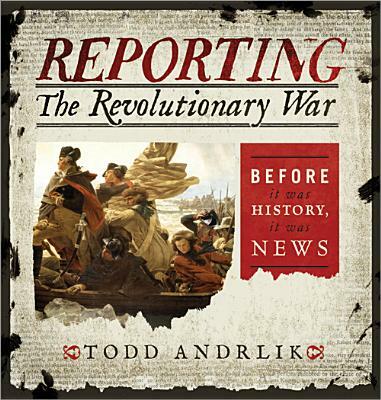 From one of America's leading Revolutionary War newspaper archivists, Todd Andrlik, and guided by scores of historians and experts, Reporting the Revolutionary War brings you into the homes of Americans and lets you see through their eyes the tinderbox of war as it explodes.